Walkin' into the kitchen, I found my brother Anderson giving the air a good sniff. "Whatcha sniffin' there, Andy?" I asked. "Givin' the ol' peep hints about changin' the litter boxes?" "No, the litter boxes are fine, Seville." "Are you sure? 'Cause you know, they don't call you Sir Fartsalot for nothin'. MOUSES!" "Seville, I heard Peep #1 talking, and she said something about something being funny. So I thought I'd sniff out whatever she was talking about. If you remember, the last time the peep smelled something funny, it was cream that had gone off. I'm hoping that's what it is again." I sat back on my haunches and looked my brother up and down. "You know, it's doin' stuff like sneakin' cream that got you the name Sir Fartsalot in the first place. MOUSES!" I stood up on all fours and added, "You, my lactose intolerant, long-haired marmie freak brother of mine, are not allowed to have cream." "But if it smells funny the peeps aren't going to take it!" Anderson cried. "And neither should you," I said with a flourish of my tail. At that very moment, my other long-haired marmie freak of a brother, Rushton, entered the room. "Guys, the word funny does have other meanings, you know. It can mean strange, too." Rushton looked closely at Andy. "Maybe the peep was telling you you were strange." "She wouldn't do that!" Andy exclaimed. "Would too!" Peep #1 cried from the family room. All three of us marmalade cats dropped our jaws in unison. I looked at Andy. Andy looked at Rushton. Rushton looked at me. Then we all turned to the family room, before getting up to march our way over to the peep and demand an explanation. "But don't worry, that wasn't what I was doing," smiled the peep as we entered the room. "I wasn't talking about any of you being strange." "So you were talking about cream bein' off? About cream smelling funny?" Anderson queried. The peep looked perplexed, but only for a moment. She's used to Andy askin' stupid questions, you see, so she has learned to ignore 'em. It took her a while but eventually she figured that out. Figured out about ignorin' stupid questions, I mean. "Seville," the peep began, "I was talking about you." "WHAT? I'M NOT FUNNY! MOUSES!" "Yes you are," the peep grinned. "But not in the way you boys were discussing. I was talking about how your blog is humorous and makes people laugh." "OH YEAH!" and I slapped a paw to my forehead. "My blog can be funny, in a humorous kind of way." "Should you really be encouraging him, Peepers?" Rushton asked under his breath. "You know how he uses that blog of his to mock Anderson and me." "That's not true!" I cried. I glanced about at the faces in the room. "Okay, so it's a little true, but seriously, long-haired marmie freak brothers of mine, I mock the peep way more than I mock either of you. Peep #1 has proven herself to be highly MOCKABLE, if you know what I mean." Peep #1 furrowed her eyebrows. "Truth hurts, doesn't it, Peepers." I stated. "But it's not my fault you do such odd things." I rubbed my chin with a paw. "Hmmm... Odd, strange, stupid, funny... Whatever." Peep #1 pursed her lips. "Seville, I have half a mind not to tell you this but..."
"Half a mind? Half a mind? Only HALF? BWAHAHAHAHAHAHAHAHAHAHA!!!!" and I rolled onto my back in a fit of giggles. "As I said," Peep #1 continued through gritted teeth, "I have half a mind not to tell you this, but..." and she raised a finger, warning me not to start laughing again. "But Seville, Blogpaws announced the finalists for the 2017 Nose-to-Nose Awards last night, and..."
"And Seville is winnin' some funny smelling cream?" Andy interjected. "Because if he is, I want in on that action, too. Seville, that's gotta be THE BEST PRIZE, EVER." Again, the peep looked perplexed, but giving her head a good shake, she continued. "Seville, your blog is one of four finalists for Best Pet Humor Blog." She stood up, and walking over to me, she bent down and scooped me up into her arms. "Congratulations my big orange dude. You're a finalist!" I narrowed my eyes. "But if you were talkin' about my blog, how come you were tellin' Andy somethin' smelled funny? And how come you were tellin' Rushy I was strange. And..."
"Seville, I honestly have no idea what you're talking about. I said no such things. What I said was, Seville will be very pleased to hear he's funny." "No, as in funny. Funny... Making people laugh and..."
"You're sure, Peepers? You're absolutely positively sure? I just want you to be really, really clear. You're talking 'bout funny as in humorous, right? You're not sayin' my writin' is odd or smells weird like cream that is off or..."
"Or about that time when I snuck some cream when no one was looking, and you called me Sir Farsalot?" Andy asked. The peep ignored Anderson's question. Sometimes ignoring Andy's questions is best. "Yes Seville, I'm talking about funny as in humorous," the peep said reassuringly. "Well in that case, THIS IS GREAT! No, this is better than great. This is absolutely mousin' fantastically amazingly mousetastic! MOUSES!!!" And with that, I tucked my head under the peep's chin and began to purr, allowin' her to give me a good cuddle. And in a very quiet voice - almost a whisper - Andy asked, "Does this mean I'm not getting any cream?" Awww... Thank you so very much! PURRS. Congrats, most deserved honor indeed, and y'all always rock the giggles! I do love makin' my pals giggle. PURRS. I saw the announcement earlier today, Seville - a BIG congratulations to you!!! Thanks so much, Summer. PURRS. YAY! Congratulations Seville, very well deserved too. Now when it comes to the prizes, if there's a choice and there's some cream to be had I'll happily have Sir Fartsalot's, sorry, Andy's ration. For his own good, of course. I shall inform the peep that you're willin' to take prizes of cream off Andy's paws for him. PURRS. Hey Baby! Yous KNOWS mes thinks yous is TOTALLY the funniest!! Awww... THANK YOU NELLIE! That's so incredibly sweet of you to say. PURRS. Congratulations, you funny feline, you! So well deserved!!! I do? Hearin' that makes my heart purr and purr AND PURR, for sure. PURRS. I'm so excited that BlogPaws selected you for "Best Pet Humor Pet Blog" finalist! You so deserving of that recognition! Love your sense of humor and wit! Hugs to you! Awww.. THANK YOU!!! What a super sweet thing to say. PURRS. Congratulations, Sir Farsalot! Just kidding, that one made my assistant laugh out loud. I think we have only visited your blog a couple of times, but will definitely be back again as we like to laugh, too. P.S. : Although we are most known for being a dog blog, we also have a lovely panther cat named Rosie and shy tuxedo named Moo Shu AND a spirited bunny named Lulu. Ruby, our dog, LOVES cats so we will see you again soon! Seville dude, we are so happy mew are in the finals, many congratulations dude we'll be cheering mew on! YEAH!!! Congrats on the nomination - Amarula feels she was robbed of course and wants to arm wrestle you for your trophy if you win!! Congratulations, and so very well deserved. You do have a good blog and it does make us laugh. Keep up the good work! Concatulations! This is wonderful news. Lots of happy dances goin' on at my house, for sure. PURRS. 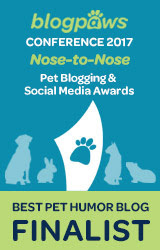 CongRATulations on being a finalist in the BlogPaws Nose-to-Nose Awards! Humor is so important---can't imagine life without it. Thanks for sharing and promoting happiness, joy and laughter! Concats on being a finalist Seville! We definitely think you are funny...in a humorous way...not in a spoiled cream way. Sorry Anderson. Maybe there will be prize money and Seville will share? Or not. SEVILLE!!! DOOD! Concatulations on such a pawesome nomination! It totally rocks bein' a finalist and all!! We're all doin' happy dances here at my house. Even the peep! Well... if you wanna call that dancin', that is. And congratulations on your bein' a finalist, too! PURRS.